I have previously discussed the remarkable similarity in optical formula between a lens released by Zeiss and a lens described in a patent from Tamron. This article is about the same patent but concentrates on AF and IS. There is a common misunderstanding of what it is that is ‘patented’. 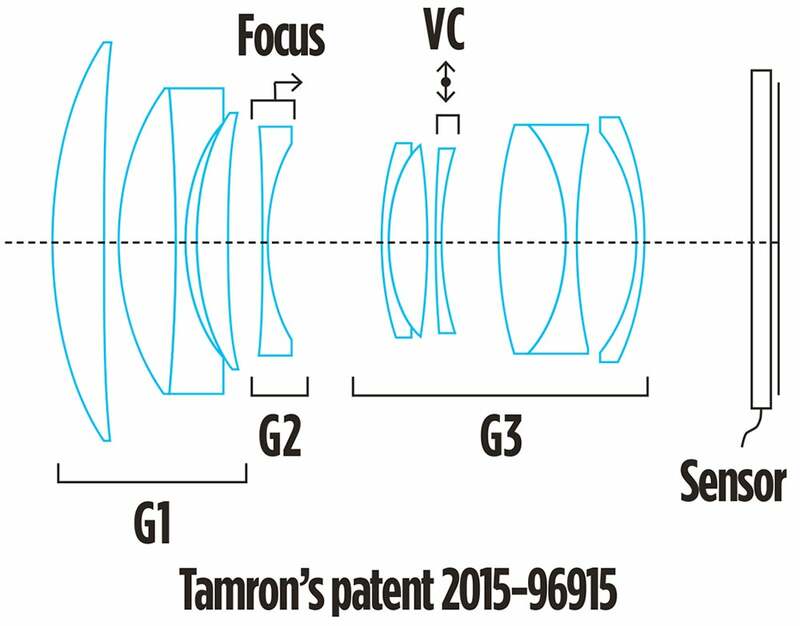 Some have said that Tamron has patented this ‘design’, which isn’t strictly possible in international patent law. Strictly, designs are protected by copyright, whereas inventions are protected by patent, although some countries such as the US do have ‘design patents’, which provide a greater degree of protection than simple copyrights. Other countries call this a ‘registered design’. In patent law, an invention is defined by a series of claims, which define the essence of the invention. In the case of the Tamron patent, the claim is for a lens constructed of three groups of elements in a classic triplet configuration (a positive group followed by a negative group, then a negative group) in which a single element negative lens in the second group is moved to provide internal focusing and a single negative element towards the front of the third group is moved laterally to provide image stabilisation. This is a useful innovation because the configuration allows these moving elements to be singlets without their movement adversely changing lens performance. The smallness of the elements, conferred by their central position, means that they are light, meaning less inertia, faster movement and thus more responsive AF and IS. Tamron’s patent discusses the issues of designing a lens for a compact interchangeable lens camera and the design options discussed in the previously patented designs. The nub of the problem is to find positions for the internal focus movement, the vibration correction movement and the aperture stop. Generally, autofocus lenses try to avoid moving the complete lens, since it is heavy and that results in slow focus. Historically, this has been achieved using front cell focus – but as Tamron points out, in telephoto lenses the front cell is large, restricting autofocus speed and also making it impossible to seal the lens. The most common solution is to adopt internal focusing, which usually involves moving the last group (which is why the lens appears to ‘back-off’ into the mount as it is focused). The issue with this design is that the lens cannot be sealed at the back, and will often get dusty. It is argued therefore that by putting the internal focus in the middle, the lens can be sealed at both ends and a small focus element employed. By using the triplet configuration, where the central lens is not responsible for correcting aberrations in the other groups, the focusing element can be simple and small. Placing the focus movement there requires moving the vibration control to the front of the third group and the aperture stop just in front of it. Since any direct copy of the published design is naturally covered by the claims, Tamron has protected the design as well as any other lens based around the same design concept.